Britain’s biggest retailer is trialling a checkout-free method of payment for its convenience stores, to rival Amazon’s Go service available in the US. 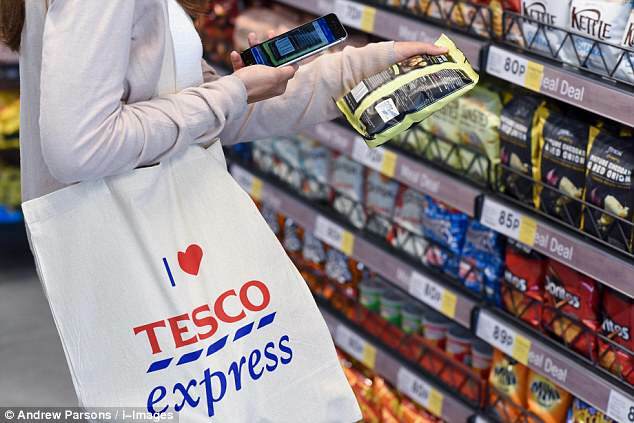 Tesco will let customers scan products on their mobile devices, pay for them with an app and then walk out with them. If successful, the trial could be rolled out to stores across the UK in the near future – provided the obvious security challenges can be overcome. The smartphones of 100 staff at the purpose-built test site can now scan barcodes and pay for their shopping using an app called Scan Pay Go. ‘Using your mobile device you select some products, put them into your basket on your device and then just walk out of the store,’ Steven Blair, Tesco’s convenience transformation director told reporters. ‘The feedback is very good on it but it’s super early. Tesco Chief Executive Dave Lewis said although the Welwyn trial could be implemented more widely, security implications had to be considered as there was a danger of increased product theft. ‘If the margin in the business is two or three per cent, you don’t have to lose much to make it unprofitable,’ he said. Mr Blair said the store was serving customers at its checkouts in about 45 seconds, versus 90 seconds for a similar sized store in the estate. He noted that some Tesco convenience stores in Britain were already down to just 20 per cent of payments by cash, making a cashless roll-out likely in the future. US retailer Amazon opened a checkout-free grocery store in Seattle to the public in January, moving forward on an experiment began in December 2016 that could dramatically alter bricks-and-mortar retail. The Seattle store, known as Amazon Go, relies on cameras and sensors to track what shoppers remove from the shelves, and what they put back. Cash registers and checkout lines become superfluous – customers are billed after leaving the store using credit cards on file. 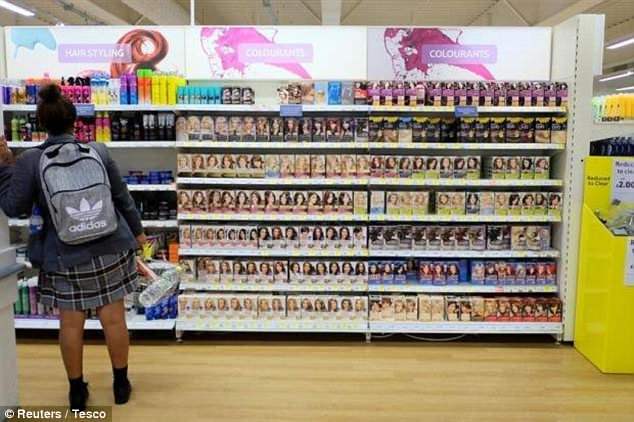 This is not the first time that reports of Tesco attempting to emulate the retail experience have emerged. In October last year, CEO Mr Lewis, confirmed that the firm was testing Amazon Go-style checkout-free supermarkets. Speaking at a press conference at the time, he said:’ When we’re at a place where we’ve got something we want to launch to all customers, we’ll launch it and we’ll communicate it. HOW DO AMAZON’S GO STORES WORK? In December 2016, Amazon unveiled a convenience store in downtown Seattle that replaced cashiers with technology found in self-driving cars. It opened to the public in January 2018. 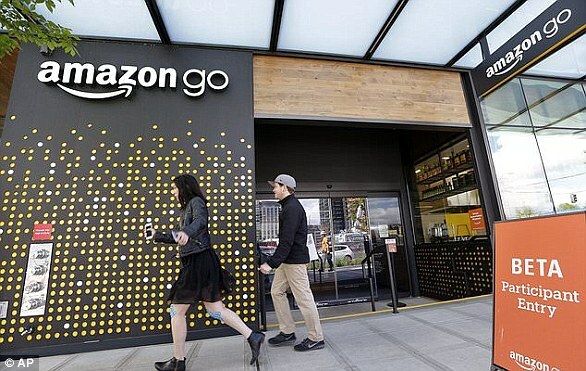 To start shopping, customers must scan an Amazon Go smartphone app and pass through a gated turnstile. Deeper into the store, shoppers can find a small selection of grocery items, including meats and meal kits. An Amazon employee checks IDs in the store’s wine and beer section. If someone passes back through the gates with an item, his or her associated account is charged. If a shopper puts an item back on the shelf, Amazon removes it from his or her virtual cart. Much of the store will feel familiar to shoppers, aside from the check-out process. Amazon, famous for dynamic pricing online, has printed price tags just as traditional brick-and-mortar stores do.